I still remember the first time someone shared a list of Google Chrome extensions with me. Each offering was better than the last, with the potential to save time and energy on everything from change sets to navigating between different Salesforce orgs. Admittedly, there are a handful of “best of” Chrome extension lists out there. The difference here is that I have personally tested, and eventually come to wholeheartedly trust, the following extensions. If I abuse any Chrome extension, it’s this one. I can’t get over the ease of clicking one tiny icon and having all my field labels instantly reveal their undercover API selves. I sit and recollect the countless times I’ve had to navigate through Setup to the object to find the field APIs manually. Never again, my friends. Never again. The moment you begin working in more than one Salesforce org, you will understand the intrinsic value of this delightful tool. If you have a browser tab problem like I do, the value is multiplied instantly. Forget about having to click into a tab to determine which org you’re in. Just glance at the little sweet clouds floating on your tabs and rest assured that all is well in the multi-org universe. This one is the little sister to the Salesforce Colored Favicons extension. The well-loved appreciated little sister. 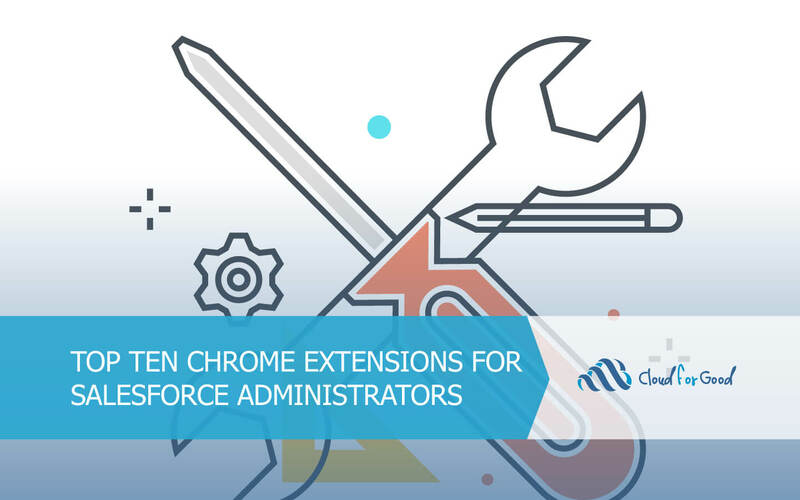 The extension uses the colored favicons, but oh-so-simply adds an “S” inside the favicon, so that you can tell that a particular tab is for a Salesforce sandbox org. No one, and I mean no one, wants to be doing configuration in a production environment. Save yourself the task of keeping orgs separate by relying solely on the tiny black box on the upper right-hand corner of a sandbox instance. Add this extension immediately. It helps to have spent an inordinate amount of time cutting and pasting Salesforce IDs to fully appreciate this little wonder. The longer you use Salesforce, and the more technical your work becomes, the less “words” and “names” mean in your interactions with records, and the more 15 and 18-character IDs rule your world. Those of us who have been on the platform since the beginning, or near enough, can appreciate the leaps and bounds made in native search functionality. This ditty takes all that advancement and goes even further. Break out of your Search bar funk and supercharge your searches. Plus, when you find yourself reminiscing about 1986’s “Flight of the Navigator” now you’ll have an excuse. I don’t know if I like this extension more or less for its name. “HotKeys” certainly sounds exciting, doesn’t it? While I’m working that out, give this one a try. If you’re like me, the only obstacle will be remembering to use it. This gem will save you approximately 250,000 clicks over the course of your working Salesforce life. Or so I’d guess. While I can’t judge this one for an unoriginal title, because the title describes exactly what it does, I can sing it’s praises for saving me loads of time. If you like to copy the URL of the Salesforce page you want to test, then navigate through Setup to the list of users, locate the user and then click “Login,” then this extension is not for you. If you want to the fewest possible obstacles between you and completing testing, then you’re about to win. Now this extension is admittedly a bit buggy. I’ve certainly found myself frustrated over not being able to expand the formula editor text area. Still, it’s a worthwhile tool, as it features syntax highlighting (among other things). There’s little worse than staring at a long, complex formula, at the end of the day and having everything, syntax, inserted fields, etc., all looking exactly the same. Install this one for your eyes, if for no other reason. For some reason I want this one to have a Game of Thrones tie-in. Alas, it does not. What is does do is allow you to quickly peek behind the curtain of a record and easily view the contents of fields that are not on the page layout you happen to have displayed. Say goodbye to the days when you had to edit a page layout, drag a field on the layout, then click “Save” to determine a field’s value on a specific record. That ship has sailed, my friends. Weird name, great tool. For those of us who can’t abide by a three-column dashboard limit, our day has come. Now you can add seven columns to a dashboard! Which means if you don’t have a large monitor, it’s time to make another change. While the column increase is wonderful, the real treat is the ability to refresh dashboards as near to real-time as presently possible. Let’s be real. The purpose of a dashboard is to provide the most accurate data available. Now you can help yourself do just that. This extension is currently free, but word is that may change in the near future. Take it for a test drive today. I looks Greytab only works in Classic, not in Lightning. Too bad. It would be very helpful.